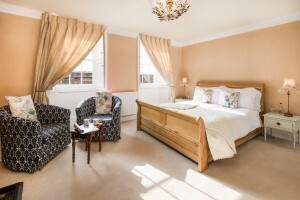 The delightful Walls Room is located on the ground floor alongside the historical Elizabethan Town Walls. 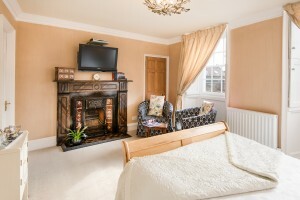 This cosy and warm room consists of a king sized double sleigh bed, two comfy bucket chairs and a large wall mounted smart TV with a full Sky TV package and Netflix. The Walls Room contains a large mirrored wardrobe with ample hanging storage and a separate alcove cupboard with shelf storage. The room is conveniently located on the same floor as the Guest Lounge with easy access to the main exit, making it a popular choice for those with limited mobility and The Walls Room has successfully been used by guests in wheelchairs. A separate door, takes you into a modern en-suite bathroom with a walk-in shower, basin and toilet. The room is also large enough to add a cot for a young child.